Whether you’re finally upgrading your kitchen or replacing a broken unit, purchasing home appliances online can be as difficult as buying yourself a new pair of shoes. If you’re being gutsy and buying a unit from an online catalog, you need to make sure you know what you’re getting yourself into. Don’t worry; we’re here to help! Here is a guide to use so you can better understand the terms and features you need to ensure you’re getting the best appliance for the best price. The first step is figuring out what your needs are. Thankfully, there are still just a few basic dishwasher categories out there, and most dishwashers are still your basic under-the-counter drop-door refrigerators, and differences center on their control panel. Full console dishwashers feature standard front-facing panels. These are generally less expensive, but they’re also considered a little gauche. The new hotness in terms of style would be high-end stainless steel fully-integrated control panels, which are invisible when the unit is closed and give your kitchen that beautiful flush look. In between are semi-integrated units, which hides most of the controls but maintain some display and control features on the front. These are a good compromise that combines form and function elegantly and gracefully. Other model types include countertop dishwashers, portable dishwashers, and drawer dishwashers, which consume less space and can offer easier installation and the price of reduced capacity. Portable and countertop dishwashers are small, single-load dishwashers limited to around fix place settings — definitely not enough for large households, but probably perfect for a couple without children in a small apartment. What Sort of Features Might I Encounter? Dishwashers can come with a wide variety of features and abilities. HardfFood disposal: A hard food disposer in your dishwasher spares you having to rinse off your dishes before you load them up, letting the hard food particles wash off during the cycle, after which they’re ground up and washed away. These can be great time-saving devices, making your cleanup quicker, more efficient, and easier for everyone. Adjustable racks: These let you change the rack height to accommodate different dishes in the event, for example, you want to have a deep top for highball glasses and a narrow bottom for bowls, or a deep bottom for lobster pots and a narrow top for lobster forks. The sky’s the limit with adjustable racks! Third racks: Third racks let you ramp up the versatility of your dishwasher pretty dramatically, letting you find even more configurations to accommodate whatever dinner it is you’re cleaning up from. These are great for large dinner parties with lots of utensils, because the third rack can take them all, letting you remove the utensil basket to allow for more space for plates and whatnot. Manufacturers offering third rack designs included Bosch, Maytag¸ and Asko. Flood and leak prevention: These can operate under different brand names, but they boil down to systems that detect pooling water and shut down the cycle before it gets out of control. All home appliances, including washers, dryers, refrigerators, and yes, dishwashers, have the potential to be energy hogs, and can get even worse because we use these items so frequently. And as we get more and more concerned about energy efficiency, reducing our carbon footprint, and practicing sustainable home living, getting that under control only gets more important. In order to make sure you’re getting a dishwasher that’s good for your home, your wallet, and your planet, be sure to check for Energy Star certification when you’re doing your shopping, and consider all the available information about water consumption. Most dishwashers use around six gallons per load, while Energy Star units use four. For what it’s worth, any dishwasher beats handwashing for energy efficiency, water usage, and soap usage. Well, that wraps up this brief buying guide. For more information, you can check out our more detailed version at the main Appliances Connection website. We do everything we can to make your purchase a breeze! Have you ever considered the many every-day items you use in your home on a daily basis? Some of the most common items are ones that many of us have never done without – however, these are inventions that once revolutionized the world. Much like the internet, cell phones and cable TV have changed the way we communicate and get information in the past couple of decades, inventions such as a refrigerator or washing machine once changed lives. The following is a list of the top five household items that have defined our living situations since their inception. Whether you’re in it for your standard eight hours, a quick cat nap, or resting due to illness, there is at least a single bed in nearly every house. This masterwork of carpentry is the centerpiece to any personal space, equivalent to the refrigerator within the kitchen. There are more designs for beds than practically any other piece of furniture in existence. Not surprisingly, the most important kitchen appliance is where we keep food that can spoil. Prior to the invention of the common fridge, families had to receive large chunks of ice and place them into a container to keep their milk from going bad. This was fairly inconvenient, but also where we get the term “ice box” from. Thankfully, we no longer have to deal with the water that collected once the large chunk of ice melted. It is said that mankind’s greatest power is to alter the environment to its need and comfort. Nothing exemplifies this idea greater than the air conditioner. Anyone who has lived through a sweltering summer day will understand immediately how important this machine is, second in comfort control only to the heater. While it may have only made its appearance as a common sight in households fifteen years ago, it is quickly climbing the charts as one of the most frequently seen items in homes. Aside from improving organizational and mathematical skills, the home computer also allows for access to the internet. With the rate at which information is exchanged in the 21st century, not having a computer can be a major inconvenience. Fashion choice might different from person to person, but everyone needs to keep their clothing clean. We have come a long way from scrubbing our garments in a basin, and most children these days won’t ever know what a washboard is. With famous brands creating household names such as the LG front load washer, washing machines have become somewhat of a fashion piece in their own right in recent years. That dang polar vortex just won’t go away, will it? Temperatures are at record chills across much of the United States, and Atlanta is so snowed under (for Atlanta) that the city has more or less temporarily collapsed. Which means that. for those of you aren’t trapped on the beltways surround the Georgian metropolis, it’s time to think about warming up. We’re at least a month out from appreciably warm temperatures, so heating is still important. And if your heating at home isn’t quite up to the task — I know mine isn’t — then I’d like to introduce you to some friends of mine. Yes, Virginia, there is still comfort in America, low as those temperatures might be, and American Comfort is one of the companies keeping you warm. For many years, American Comfort has been a world leader in portable and easy climate control. They have a comprehensive line of home heaters ready to make you toasty warm. With everything from traditional heaters to innovative portable infrared heaters (which are much more energy efficient), you know that you’ll be able to find exactly the right heater to kick your home from “slightly chilly” into “just right” territory in no time. American Comfort products are all made to be efficient, affordable, long-lasting, and attractive. These are heaters with refinement and class; beautifully-designed and seamlessly engineered for excellence and perfection, featuring technology that prevent overheating, lessen the risk of starting a fire, and produce an amazing, luxirious, soothing warm that won’t escape the room. Forward-looking designs that are perfect for every home; that’s what American Comfort offers, with quality they stand by. That means that you can wall yourself off from the ravages of winter for years to come, safely tucked away in the warm embrace of American Comfort. Well, the Super Bowl is coming up. Super Bowl XLVIII, to be precise. Don’t get too worried by that string of Roman numerals; we’re only two years away from 2016’s Super Bowl L. Here in New York, we may not have a team in the game but for the first time, the game itself is being hosted on our home turf, just across the Hudson at the Meadowlands, home of the Giants. This is the first open-air Super Bowl to be held in a cold weather city, which means that it might be frigid out there, both for the players and for the spectators. And since if you don’t have a ticket already you probably can’t get one, you’re just gonna have to watch it at home. But that doesn’t mean it can’t be a party, does it? Absolutely not. Break out the bright-red Daisy cups, make sure you’ve got plenty of ice, and get ready to dig in, because a Super Bowl party is more than just cracking open a bag of Doritos and ordering a pizza. Heat the oven to 400 degrees. Arrange the corn chips on a large baking tray. In a large bowl stir together the shredded chicken, ¾ cup sour cream, ½ cup salsa, green onions, fajita seasoning mix, and fresh lime juice. Mix well. Spoon the chicken mixture evenly on top of the corn chips. Sprinkle the chicken with the black beans, banana peppers, and olives. Top with shredded cheese. Bake the nachos for 3 to 5 minutes or until the cheese is melted. Garnish with avocado slices, the remaining salsa, and the remaining sour cream. Add the jalapeno peppers for additional flavor, if desired. Heat the oven to 400 degrees. In a food processor, combine the enchilada sauce, 1/4 cup of the cilantro, the jalapeños and 2 of the green onions. Cover and process for 20 to 30 seconds or until smooth. Pour in to a small container and refrigerate. Rinse the food processor bowl. Place 1 cup of the corn in the food processor. Cover and process for 20 to 30 seconds or until smooth. Add the butter, sugar and a pinch of the salt. Cover and process for 30 seconds or until smooth and well combined. Add the masa harina and the flour. Cover and pulse for 4 or 5 times or just until moistened. Stir in the remaining 1/2 cup corn. Turn the dough onto a work surface lightly coated with masa harina. Roll the dough into a log. Cut in 8 portions. Pat each portion into a 3-inch round. Place on an ungreased cookie sheet. Bake the cakes for 15 minutes or until the bottom is a deep golden brown. Turn the cakes over and bake for 5 minutes longer or until golden brown. Meanwhile, chop the remaining 1/4 cup cilantro. In medium bowl, mix the cilantro, tomatoes, bell pepper, lime peel, lime juice and remaining salt. In a small bowl, mix 1/3 cup of the sour cream, the mayonnaise and taco seasoning. To serve, pour the chilled green sauce on a serving platter. Top with the hot corn cakes. Spoon the tomato mixture over each corn cake. Drizzle with the sour cream sauce. Dollop the cakes with the remaining sour cream. Combine the tomatoes, onion, garlic, lime juice, olive oil, salt and pepper in a medium bowl; mix well. Add the avocado and mix, mashing the avocado slightly. Fold in the sour cream. Place plastic wrap directly on the surface of the dip. Refrigerate until ready to serve. Serve with tortilla chips. Heat the oven to 425 degrees. Move the oven rack to the center position. Mix the chicken, cheese, chiles, adobo sauce, taco sauce and chopped cilantro in medium bowl. On a lightly floured work surface, roll out one pie crust to a 12-inch circle. Using a 3-inch round cutter, cut out 15 circles. Using half the chicken mixture, place 1 slightly rounded teaspoon mixture in center of each circle. Brush the outside edges lightly with the egg. Fold over to make half-moons and pinch the edges to seal. Place the empanadas 1-inch apart on a large ungreased cookie sheet. Press around sealed edges with a fork. Prick the tops with a fork and brush with the egg. Bake in the center of the oven for 10 to 12 minutes or until golden brown. Meanwhile, using the remaining pie crust and chicken mixture and cheese, prepare the remaining appetizers. Place the second batch of empanadas on another cookie sheet. Bake as directed above. Mix the sour cream and garlic powder in small bowl. Serve the empanadas with a dollop of the sour cream mixture. Tip: The empanadas can be made ahead of time, covered and refrigerated prior to baking. Add one minute to the baking time if prepared ahead. Pre-heat the oven to 425 degrees. In a large bowl, combine the potatoes, oil, salt, pepper and chili powder. Toss until the potatoes are evenly coated with the seasoning. Spread the potatoes out on a sheet tray lined with parchment paper. Bake the potatoes for 25-30 minutes or until tender when pierced with a fork. While the potatoes are cooking, mix the sour cream, the dip mix and the heavy cream in a medium bowl; combine well. Once the potatoes are done, transfer the wedges to a serving platter. Spoon the sour cream sauce over the potatoes. Top the wedges with bacon bits and green onions. Place the hot sauce into a small saucepan and heat until warm. Add the butter and whisk until melted; set aside. Mix the sour cream, blue cheese, mayonnaise, Worcestershire sauce, salt, and garlic in a medium bowl. Mix the dip until incorporated; place in refrigerator until ready to serve. Preheat the oven to 425 degrees. Place the wings on a sheet pan and toss with the oil. Bake the wings for 20 minutes. Remove the wings from the oven and place them in to a large bowl. Add the hot sauce mixture and toss with the wings until they are evenly coated. Serve the chicken wings along with the blue cheese sauce for dipping. Modernizing Appliances: How Much is Too Much? Living in a time when technology is advancing at a rate faster than ever before can be extremely comforting when it comes to medicine and communication. It can become confusing when large scale corporations expect you to be perfectly comfortable with talking to your appliances. Recently, the big bandwagon that many home electronics companies seem too eager to jump upon is forcing their models into the “computer age”. The most obvious example of this overwhelming need to digitalize everything is the refrigerator that owners can freely communicate with. Want to know how much milk is left? Simply ask the glowing screen on the front of your refrigerator to find out. Interested in cooking dinner for a few friends, but have no idea what to make? Just let the fridge decide for you. While these features might seem awesome at first, practicality soon catches up with novelty when it comes to futuristic appliances. First, in order to keep an accurate record of how much food is in the refrigerator, you actually have to key in the amount added or removed from the ice box. Failing to do so will lead to false testimonies, and the last thing you want to deal with at7:00 AM is drinking black coffee because your son or daughter forgot to punch in their withdrawal of breakfast milk. Is it possible that our kitchen could do with a little modern updating? Of course, but the technology to make conversational appliances convenient without needing to obsessively catalogue your grocery usage does not yet exist. For the time being, we might have to deal with the fact that opening the door and taking a cursory glance at our provisions is the best way of figuring out what there is to eat. When you look at refrigerators for sale, are you interested in the most advanced model or one that fulfills the simple need of keeping food cold? Are you interested in having a fully voice operated home, or are you satisfied with kitchen technology as it stands? Something remarkable happened in the mid-1980’s. Since the middle of the 1970’s, luxury-conscious consumers had been installing full commercial ranges in their homes. They liked the stainless steel construction — designed to be effortless to clean — and the easy engineering of the large knobs and pulls. Commercial ranges had a sense of solidity and gravitas which communicated a certain je ne sais quoi, making the kitchen start to feel like a truly special place where amazing things could be done. But as this practice spread, problems began to arise. Quite simply, these were appliances which were not designed for usage in the home. They ran too hot, too quickly; designed for bulk cooking, they would overwhelm smaller home meals. They were dangerous in homes with children, as they kept their gas light burning constantly and lacked child safety locks. They didn’t even have anything as simple as a broiler. This would not do. So when Fred Carl, Jr. had his famous idea of a high-end commercial-quality and commercial-style range that was specifically designed for home use, he knew he had to turn to the best to design it. That’s why he turned to Surjit Kalsi. Kalsi, who got started in industrial design in 1957, had nearly thirty years of experience engineering home cooking appliances. He’s been called a “barbecue cowboy” for his original innovative outdoor stainless steel grill (which got him thrown out of a distributor’s office, and is now a multi-billion dollar industry). Kalsi, in other words, is the industry-defining designer who has completely changed the field in the same way Steve Jobs changed home computing. He’s the man who engineered the first Viking range, that legendary appliance that redefined home cooking. He’s also the chairman of Capital Cooking, where his genius continues to influence and define the industry. Capital carries forward the design legacy of the original Viking range, bringing that same brilliant thinking and innovation to their entire product line, from indoor and outdoor ranges — including the ultra-powerful Culinarian series featuring an open burner system, 23,000 BTUs of cooking power, and a constant even simmer — to the world’s finest stainless steel grills. All of them carry the imprint of the original genius, Surjit Kalsi. So don’t be afraid of making the switch from Viking to Capital. Viking might have the legendary name, but only Capital has the legend. Now that we are locked in the freezing threat of winter, we must hunker down in our homes and stay warm until spring arrives once again. While very few of us enjoy the extreme chills and potential snow fall, we can still get excited about the prospect of updating our home during the winter. For the most industriously minded out there,the cold season is a wonderful time for interior home improvement. If you’ve already taken care of the most common problems that plague home owners, you can look into the bigger tasks since over the next few months you’ll likely find yourself indoors more often. A popular trend that has recently gained a lot of attention is kitchen improvement. Have you recently moved out of a larger house and can’t possibly find a way to fit everything you own into a smaller living space? Do you not have the funds to rent out a storage space for all of your excess possessions? If tossing out what you can’t fit just isn’t an option, there may still be hope. Finding enough space in a new living arrangement can often be difficult and frustrating, but it’s never impossible! Whether you’re a newlywed couple moving into your first apartment together, or a college student dueling for space in a new dorm room, there are always methods of freeing up unused area. Anything small, flat, or long that you can’t find a better place for can easily be stowed under your bed. As it is typically the largest item in a bedroom, the bed can easily consume a huge portion of your available space. The underside, however, is perfect for those objects you don’t need immediate access to on a daily basis – luggage, alternate pairs of shoes, and other such things can easily be slid in and out of this hiding space. If you’re afraid of clutter, you can also package up a collection of small things into a plastic container and slide the whole box under the bed as a single unit. There are certain tools that we cannot live without, no matter how big or small our home is. Imagine trying to live without having a refrigerator or over? Thankfully, it is possible to purchase electronic appliances that fit the shape and size of your home, even if it’s not exactly large. If your apartment complex doesn’t offer a service room to wash your clothes at, it may be best to buy dryers or washing machines of your own. Even if there is a Laundromat nearby, depending on how often you wash your garments, you may end up losing money traveling there and back. Your wall is more than just a place to pin your favorite posters, its perfect room real estate! There are many different sorts of wall hooks, and you should make your decision based on the weight of what you wish to hang. These hooks are great for holding your jackets, bags, wires, cords, and pretty much anything with a wire or strap! Also, hanging things on or near your door is a sure way to help you remember them on your way out. Winter is right around the corner, and what better time is there to start working on interior home improvement? Although the weather might not be perfect, that doesn’t mean you should shirk the duty of keeping up your home. If you still want to accomplish your goals while snow is falling, get ready to turn your interest indoors. Check out these brilliant ideas that are sure to keep you busy and improve your home during winter! With summer a long way off, it’s time to ensure that your home has the right look for the colder season. The same colors that help make your rooms seem alive during August or June don’t work the same magic when snow is falling outside. Switch out those bright and flashy hues for something a bit more muted and reserved for a calming, soothing winter season. 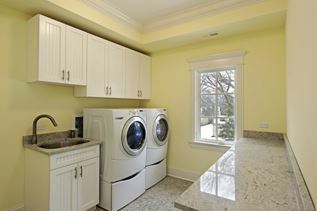 One of the busiest rooms in your house during the winter season is most likely the kitchen. Due to the amount of holidays and need for warm meals, you might find that your old stove or oven can’t quite keep up. Thankfully, new freestanding ranges are easy to find and purchase without much hassle. Ensuring that your kitchen is in perfect working order before the family comes to visit is integral to a happy holiday. After all, don’t you deserve to have an up to date, fully functioning stove and oven? Depending on where you live, snow could be a serious threat. If you live anywhere that has a relatively high amount of precipitation, it is important to stock up on household goods before you become trapped. There might not be a guaranteed time by which you can get to the store, so remember to pick up a little more than you think you’ll need. Consider purchasing things such as light bulbs, batteries, water, and canned food to help last the season. Even if you don’t need to deal with a state of emergency, having the extra supplies won’t hurt! Many homes have spare rooms, usually converted into a guest room. If you aren’t getting as many guests as you expect, this could be a waste of precious real estate. Perhaps that room could be put to better use as a place to do activities or work out, since you won’t be going outside as much. Don’t allow your quality space to collect dust, find a new hobby and embrace your new creative space.